> Android Training > How to Choose the Best Android App Development Course in Jaipur? 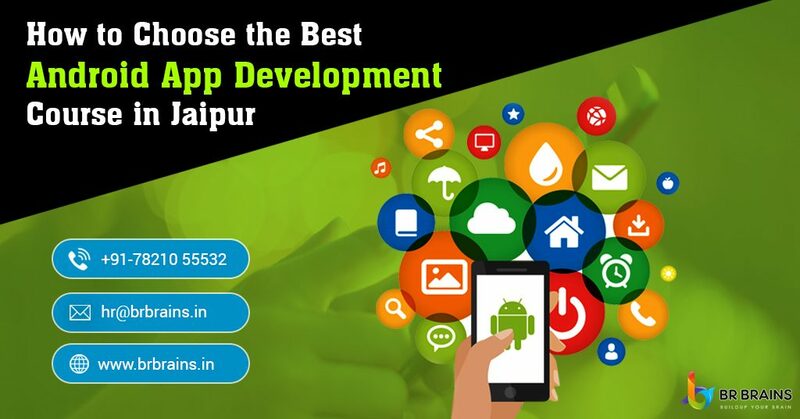 How to Choose the Best Android App Development Course in Jaipur? Looking for the best Android app development training institute in Jaipur, where you can enhance your experience in a good way? The Android training plays a vital part in the trainee’s lives as the Android field is a wide field and with time, it gets updated and new innovative technologies and versions mark their presence in the field. There is a huge demand for the Android developer as the market is growing rapidly. There are wide opportunities for the Summer Internship Center in Jaipur but before don’t join the Android internship in hassle. There are various points that you have to keep in mind before joining the internship as its effects on your Android training. In this article, we brought some tricks that will help you to choose the best Android training center in Jaipur. 1) Course Content: As the Android market is continuously increasing and becoming wider. The course is also used to upgrade and new chapters mark their presence. In the Android market, it is essential that you should be upgraded with the latest tools and technologies. To get trained according to the market is the essential need of your Android training. 2) Live Project: Practical knowledge is really essential, make sure that the Android app training institute offers your a training on the live project, especially in the industrial training program. The live project helps you to boost the confidence in your and through it, you are able to know about your abilities and where you need to work more. 3) Infrastructure: The Android training infrastructure plays a vital part of Android training. The infrastructure helps you to get the professional learning environment, preview the environment as it should have a proper system, software and all the requirements of the learning environment including chairs, desk etc. The equipment should be properly settled. But don’t avoid other points, if you get the best infrastructure, so don’t get influenced towards it. 4) Certificate: The certificate is really important for your Android training, make sure that the Android training Centre provides you the Android training certificate as soon as the training gets complete. Most Android coaching centers influence with the good certificates, but at that point be clear and demand for the legal and licensed certified Android training certificates. 5 Faculties: Without teachers, you ca n’t expect your learning, the faculty plays an imperative part in our training programs. Their communication skills really matter a lot. Before joining the training institute, have a communication round with the different teachers to know their way of communicating and exchanging their thoughts and ideas. BR Brains is a well known Android training institute in Jaipur. Who fulfills all your desire for the Android training, the best coaching center offers you to turn as a well versed Android developer. We have a combination of expert, skilled, professional and certified professors, who put their all efforts in your Android training. Android course upgradation: Time to time we upgrade the Android course in all aspects, our course is designed in the best way by our professional team. Our Android course includes an Android Architecture overview, Overview of Android Resources, Main Building Blocks, User Interface, Setup of Android Development environment, Android on real time projects. It helps to achieve the career goals. High Tech Infrastructure: Our focus is to offer a high level of infrastructure to our students with the advanced lab facilities. We understand that infrastructure matters a lot in the training session as it helps students to bring towards the learning environment. Placement: We offer full support to provide you the job and our networking helps you to bring the contacts in the market. Our team helps you to get in top multinational companies with the best package. We also help you by providing the reference and in fact helps you to boost your resume. Certificate: We provide you the BR Brains coaching center certificate, which will help you in the market as well as in your institutes. BR Brains certificate we provide you immediately after your Android training. Live Project: BR Brains is a sister branch of BR Softech – best web and app development company. We offer you to work on the live Android projects of our client’s under the team of specializations. It will mold your career and your portfolio will also develop via it. If you are looking for the best training institute in Jaipur for Android training, so here is a perfect ideal institute which is marking presence since years. To opt BR Brains will one of the best choices for your Android career, even you can opt for the iOS training. Very nice summer internship company in Jaipur for computer science engineering students' I have to recommend to all students to join BR Brains. When you Submit the Inquiry form you will receive a short call within 24 hours by our training expert department. They will understand your concern about the training and consult the best solution about your training queries. It is taken for the purpose of providing information about the training by the authorized person.